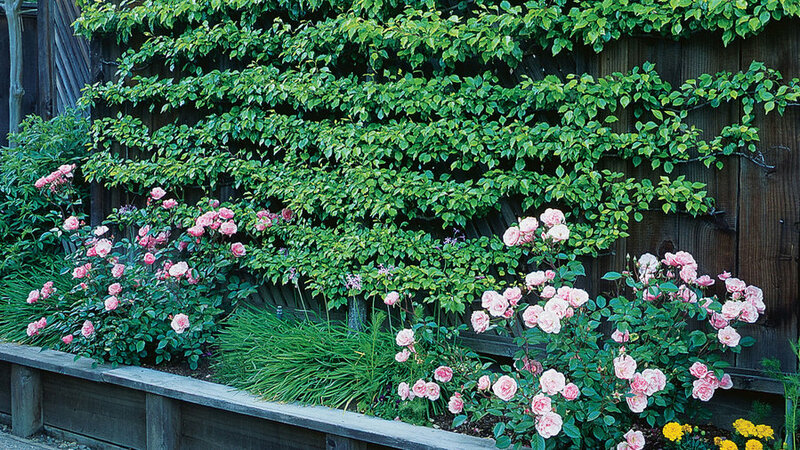 Espalier, pronounced either “es-pah-lee-er” or “es-pah-lee-ay,” depending on how French you want to sound, is the art of training plants to grow against a wall in desired shapes. In a formal setting, climbing plants are often made to follow geometric pathways. In an informal backyard, vines may be attached at somewhat more random locations and allowed to follow their natural inclinations in between. The process can take years, depending on how quickly the plant grows. (Espaliered trees are often managed for decades.) Typically, you will need to spend an hour or so two or three times a year trimming away wayward stems and shoots and encouraging the plant in the directions that please you. Consult with a plant expert at a nursery or home center to determine how far away from the wall you should position the wires; thick branches will be trapped by (and may “swallow”) wires that are too close. Instead of the 2-inch eyehooks we show, you may choose to install longer threaded rods with two bolts and run the wire between the bolts. Steps 1-3 show how to attach eyehooks to a masonry wall, the most typical backdrop for espalier. If your wall is covered with wood or vinyl siding, you can drive eyehooks directly into the wall ― as long as the sheathing beneath is solid wood or plywood. Otherwise, drive long eyehooks into the studs instead.